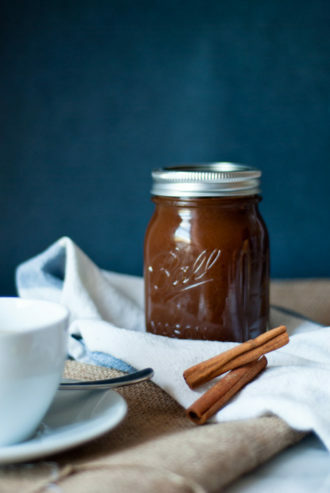 Starbucks may have popularized pumpkin spice lattes, but come fall, there are plenty of other ways to highlight pumpkin spice syrup, and luckily, one of our favorite blogs, Two Red Bowls, has a recipe inspired by formulas from fellow bloggers Annie’s Eats and A Beautiful Mess. Try a splash in your next hot toddy or mulled cider. Combine the water and both sugars in a saucepot and bring to a boil. Stir until the sugar dissolves, then reduce heat to low. Add the cinnamon sticks, ginger, nutmeg, cloves and pumpkin, and whisk vigorously to combine. Let simmer for about 5-10 minutes, stirring constantly. Do not let it come to a boil. Turn off the heat and let cool for 10-20 minutes on the stove. Strain through a fine-mesh strainer and store in the refrigerator for up to 2 weeks. Makes 2 cups.